Samsung is expected to launch a new flagship tablet later this year and the reports we have seen so far suggest that the Galaxy Tab S4 is just around the corner. Samsung is yet to confirm anything officially about this device but enough circumstantial evidence has surfaced over the past couple of months to give us an idea of what to expect from the Galaxy Tab S4. 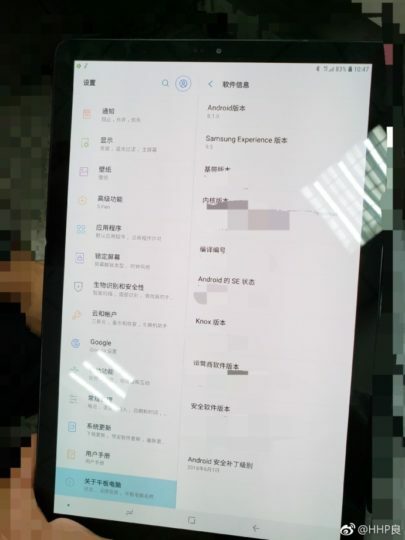 A live image of the Galaxy Tab S4 has leaked out of China and the source mentions that the Galaxy Tab S4 specs may include an iris scanner as well. The tablet is even said to have support for DeX, Samsung’s productivity platform which allows supported devices to power a PC-like experience on an external display through a dock. We recently reported that the Galaxy Tab S4 will likely ship with Android 8.1 Oreo onboard and this live image reiterates that as we can see that the tablet is on Samsung Experience 9.5. The devices on Android 8.0 Oreo are running version 9.0. Previous reports have revealed that Samsung is shifting to the 16:10 aspect ratio for the Galaxy Tab S4’s 10.5-inch display. So while it’s going to feature a virtual home button it won’t be pressure sensitive like it is on Samsung’s flagship smartphones. The Galaxy Tab S4 specs are also said to include 4-channel AKG Dolby Surround sound. As far as the rest of the Galaxy Tab S4 specs are concerned, the tablet is going to be powered by the Snapdragon 835 processor with 4GB of RAM and 64GB of storage. It may also have a 13-megapixel camera at the back and an 8-megapixel camera up front. We also reported recently that Samsung has a new “Book Cover Keyboard” accessory for this tablet in the pipeline. Samsung is yet to confirm when it’s going to launch the Galaxy Tab S4. It’s possible that the company may launch the tablet at IFA 2018 which takes place in Berlin this September.